'Let love and friendship reign', the phrase aptly summarizes the essence behind the beautifully crafted Claddagh wedding rings. Consisting of two hands joined together to support a single heart with a crown upon it, a Claddagh wedding band is symbolic of love, loyalty, friendship, fidelity and a proud Irish heritage. 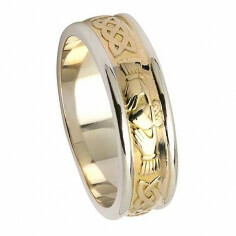 Said to have been first crafted more than 300 years ago in Claddagh, Ireland. 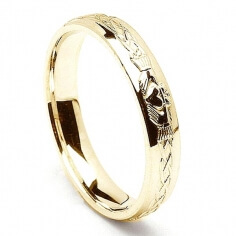 This is a truly beautiful handcrafted Claddagh inset wedding ring made in gold and featuring a Claddagh design inset into the band. 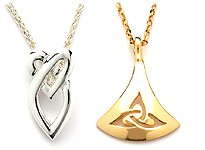 To each side of the Claddagh is the ancient Trinity knot design and an accent diamond. 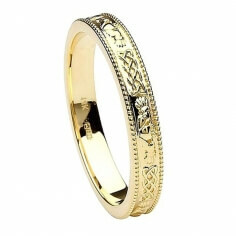 This ring is the perfect wedding band for women or men who cherish thier Irish and/or Celtic heritage. This beautifully designed wedding ring has a white gold band with a white gold Claddagh design inset into it. On either side of the Claddagh, our craftsmen have set a sparkling accent diamond. Our craftsmen have designed the diamond Claddagh wedding ring, consisting of a yellow or white gold band with a white or yellow gold Claddagh design inset into the band. To each side of the Claddagh are set three sparkling accent diamonds and to the other side of the diamonds is a Celtic Infinity knot. Crafted from cool white gold, the diamond Claddagh wedding ring is a stunning piece of work. The Claddagh symbol is built into the band and is separated by several sparkling diamonds on either side. This diamond Celtic knot Claddagh wedding ring has the appearance of a trim either side because the designs are inset into the band. 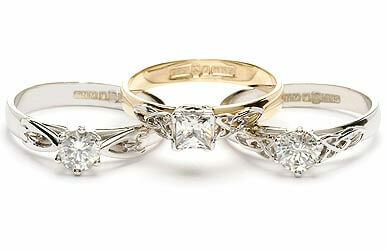 There is the famous Claddagh design in the center and Celtic knots on either side, all set with sparkling diamonds. The men's version of the ring has no diamonds, giving it a more masculine feel. The Celtic knots and Claddagh symbol are laced with sparkling diamonds set in a 14K white gold band. 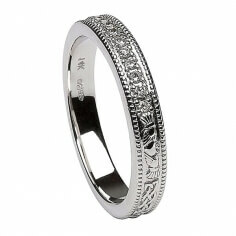 Diamonds and white gold are a match made in heaven, perfectly complimenting each other in this womens wedding band. 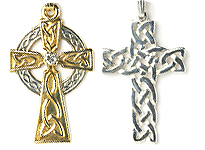 Bold Celtic knots from both sides meet the white gold Claddagh symbol in the center. 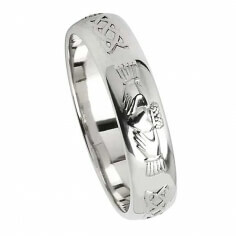 Representing love, loyalty and friendship, the Claddagh makes for an ideal wedding band. 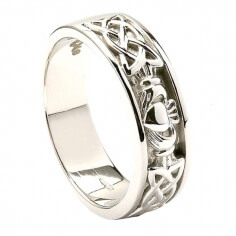 The men's Celtic knot white gold Claddagh ring is certainly a standout. 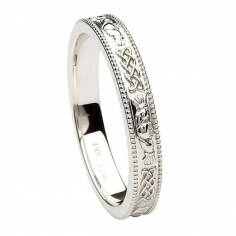 Crafted from 14K white gold there are two intricate Celtic knots engraved into the band. 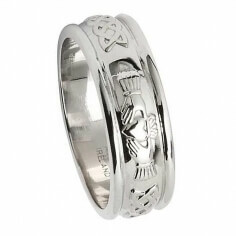 The center is a Claddagh design representing love, loyalty and friendship. This men's Sterling silver Claddagh wedding ring is handmade in Ireland. 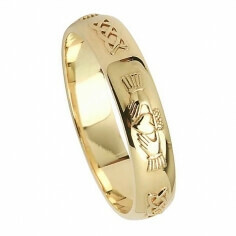 The Claddagh symbol is expertly set into the band and on the inside of the band are the words love, loyalty and friendship - the three values the Claddagh design represents. Wonderfully presented in a luxurious ring box. This women's Claddagh wedding ring is crafted from the finest Sterling silver. 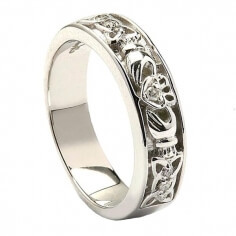 The Claddagh design is inset into the band, giving it a more solid appeal. The words love, loyalty and friendship are engraved on the inside of the band. Handcrafted with care by experienced Irish artisans. The women's narrow white gold Claddagh band is sleek yet detailed in design. 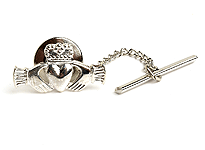 The Claddagh represents love, loyalty and friendship - three values worth celebrating. The women's narrow Claddagh wedding ring has a contemporary feel suitable for a modern bride, but the ancient Celtic knot and traditional Claddagh designs that encircle the band bring to mind older wedding customs. This elegant band is of the highest quality, as evidenced by the hallmark. Do you love the lustre of white gold coupled with sparkling white diamonds? Then the Narrow white gold diamond ring is for you. 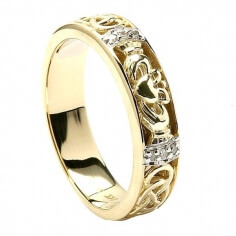 Ideal as a women's wedding or anniversary band. 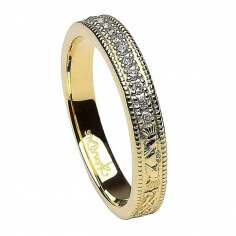 The ring features a group of channel-set diamonds in the eternity band style. The diamonds then transition to an alternating pattern of traditional Irish Claddagh symbols and Celtic knots. The entire center motif is unified by two rows of golden crown studs framing the top and bottom. This simple, but very elegant handmade engraved womens Claddagh wedding ring is available in 925 Sterling silver. It will carry the hallmark of the Dublin Assay Office. 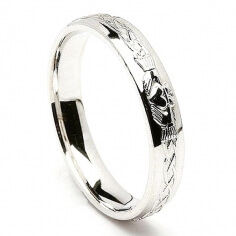 This beautiful men's engraved Claddagh wedding ring is crafted from Sterling silver. Proof of this can be found on the inside of the band where it bears the hallmark of the Dublin Assay Office. This simple, but very elegant handmade Claddagh wedding ring is available in Sterling silver, white or yellow gold. All versions will carry the hallmark of the Dublin Assay Office. 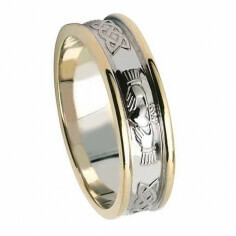 As well as the Claddagh design also featured is the Celtic knot surrounding the band. 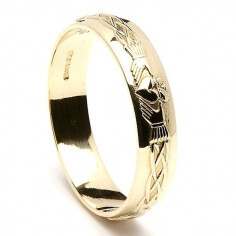 Rising out of the gold band is the Claddagh symbol and all that it represents; love, loyalty and friendship. 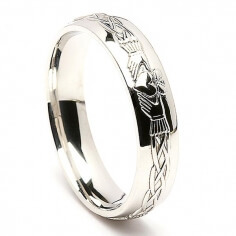 Beautifully engraved Claddagh and Celtic designs to create a unique mens wedding band. Handcrafted in beautiful white gold, the women's engraved Claddagh ring will suit every bride. 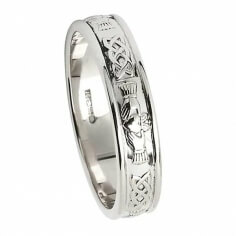 The Claddagh design is tied together with an intricate Celtic knot engraved into the wedding band. 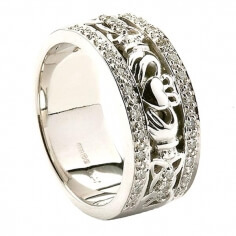 This simple, yet elegant design of the mens engraved white gold Claddagh ring makes it all the more noticeable. 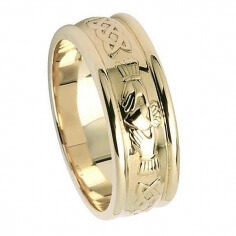 Carefully crafted by hand, each Celtic and Claddagh design is meticulously engraved into the wedding band. A pair of these beautiful handmade matching rings would suit both bride and groom perfectly. 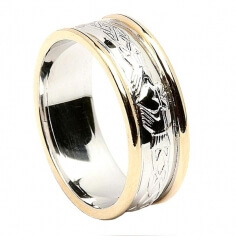 The engraved Claddagh wedding ring with trim connects the Claddagh design with an eternal Celtic knot design. 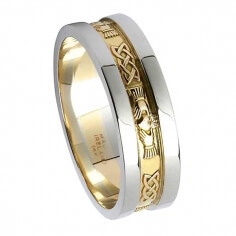 Blending the ancient Celtic, and more modern Claddagh symbolism in one fantastic wedding band. 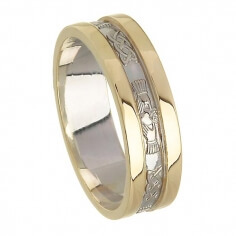 Introducing the Engraved Claddagh two-tone wedding band. 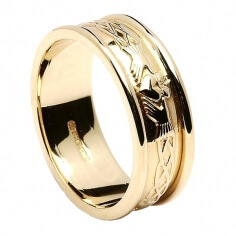 Claddagh symbols engraved into the central yellow gold band and intertwining Celtic knot designs tying them together. 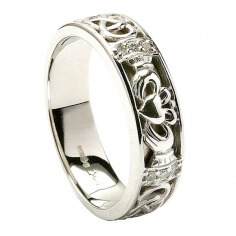 A white gold central band has the Claddagh and Celtic knot designs engraved onto it. On either side of that band is a white gold rim, giving the overall ring a more solid look. 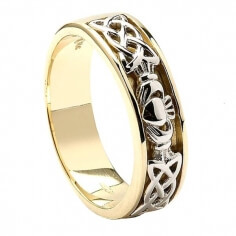 The engraved Claddagh symbols are connected by an infinite Celtic knot design. The central band is made from yellow gold, as are the two accompanying rails on either side of the band. Introducing the women's silver Claddagh wedding ring, a truly stunning piece of craftsmanship. 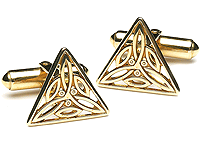 The famous Claddagh design is brought together with separating Celtic knot designs. 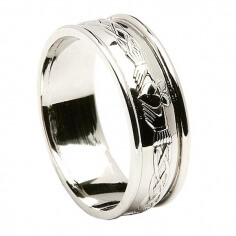 The men's Claddagh silver wedding ring is handcrafted from the finest 925 Sterling silver. On the inside of the band you will find the hallmark of the Dublin Assay Office, this is your mark of quality and authenticity. The Claddagh wedding ring is surely one of our most beautiful wedding bands. 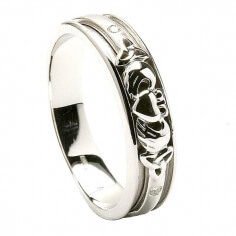 The famous Claddagh design is polished, contrasting against a matte finish background to enhance it. 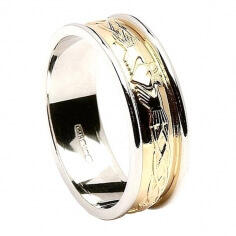 The men's Claddagh wedding ring is a statement ring. The Claddagh design represents love, loyalty and friendship - three core components to every marriage. It is available in either 14k or 18k yellow gold. The women's white gold Claddagh wedding ring is as lustrous as it is elegant. Available in both 14k and 18k white gold. 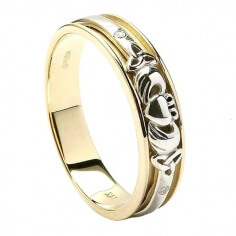 The famous Claddagh design is incorporated into the band that represents love, loyalty and friendship. The men's white gold Claddagh wedding ring is built to last and is available in either 14k or 18k white gold. 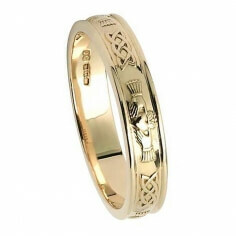 Each Claddagh symbol on the band is separated by Celtic knot designs. Introducing our beautiful Claddagh wedding ring with trim, our skilled craftsmen have added a gold trim to each side of the band. The Claddagh symbol represents love, loyalty and friendship. 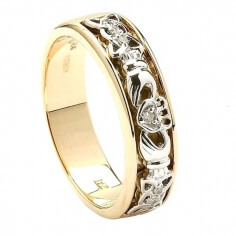 This beautiful Celtic Claddagh wedding ring is available in 14K gold. The polished Claddagh design is set against a brushed finish to create a stunning impact. 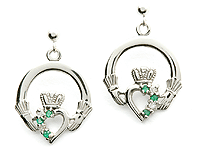 The Claddagh design symbolizes love, loyalty and friendship. The meaningful silver friendship ring is not only ideal as a wedding ring, but also as it was intended to be, a friendship ring. A friendship or commitment ring, as it has the symbol for "Love, Loyalty, Friendship" engraved on the band. The Irish friendship ring is ideal not only for a wedding ring, but also a friendship, or commitment ring, as it has the symbol for "Love, Loyalty, Friendship" engraved on the band. Each Claddagh emblem is separated by an infinite Celtic knot design. Crafted from 14k or 18k white gold, this friendship band signifies the deep understanding between two souls. 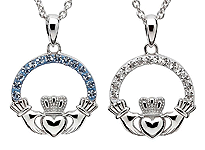 Love, loyalty and friendship are values highlighted in the engraved Claddagh designs. The symbol for "Love, Loyalty, Friendship" are shown on this friendship ring with the inclusion of the classic Claddagh design. This is one of our more solid wedding rings, it has a contrasting 2 mm white gold trim. This immaculately designed Claddagh wedding band is truly an ideal wedding band for a couple to wear for the rest of their lives together. The Claddagh symbol is the perfect description for the qualities every marriage should possess; Love, loyalty and friendship. Planning on popping the big question? Browse our full range of Claddagh engagement rings, all showcasing real gemstones including certified diamonds, sapphires, rubies and of course, emeralds! Nothing says love like an authentic Irish engagement ring. 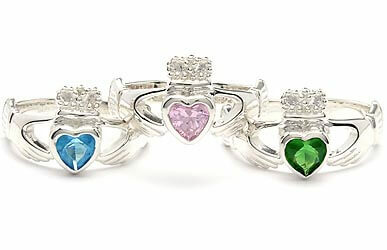 Celebrate that special birthday with a Claddagh birthstone ring. All crafted from Sterling silver, made in Ireland nad hallmarked by the Dublin Assay Office. Match the Claddagh birthstone ring with a necklace or earrings to make the perfect birthday gift for that someone special. One of the most recognizable ring types in the world, the authentic Claddagh ring will have a heart with a crown that is held by two hands. Representing love, loyalty and friendship. Buy your authentic Irish Claddagh ring from our select range. All handmade in Ireland.